Rumen microorganisms, as a population, have no absolute requirement for amino acids (Virtanen, 1966; Salter et ai, 1979). Individual species within the population do have amino acid requirements, however, which can be met by the breakdown of bacterial protein in the rumen, and by synthesis from a number of C-skeletons as described above. There is, however, plentiful evidence that providing amino acids, peptides or protein stimulates growth rate and yield of both the mixed population and individual species. Whether the influence on growth rate results from relieving an absolute amino acid requirement in a small number of individual species in the population, or whether it reflects a rate-limiting biosyn-thetic step in general, is not clear. Many studies have demonstrated the benefits of supplying preformed amino acids to ruminal microbes (reviewed in Chikunya et ai, 1996). Stimulation did not occur, however, when the energy substrate was high in plant fibre (Cruz Soto et al., 1994; Chikunya et al., 1996), suggesting that the response to amino acids depends on the rate of degradation of the energy source. Such a difference is part of the Cornell model (Russell et ai, 1992), which divides the bacterial population into two populations, one which is fibrolytic and does not respond to amino acids, the other which is sugar- and starch-fermenting and does respond to amino acids (see below). The effect on growth yield is one that might be expected from bioenergetic considerations of the energy requirements of amino acid synthesis under anaerobic conditions (Barker, 1981). An increased yield approaching 20% was observed by Russell and Sniffen (1984), who used glucose as the energy source. Maeng et ai (1976) observed an 18% increase in growth yield on glucose when casein was added, compared to a 53% increase when cel-lobiose was the energy source. The Cornell model (Russell et ai, 1992) assumes a variable increase in yield, depending on the ratio of amino acids to total organic matter, up to 18%. Three main approaches have been taken so far in attempts to identify the key amino acids which limit rumen fermentation. One involves adding amino acids to a fermentation mixture in which ammonia is the only other source of N. Maeng et ai (1976) and Argyle and Baldwin (1989) added single or groups of amino acids to ruminal fermentations in vitro. They found that only complete mixtures of amino acids gave maximum responses. 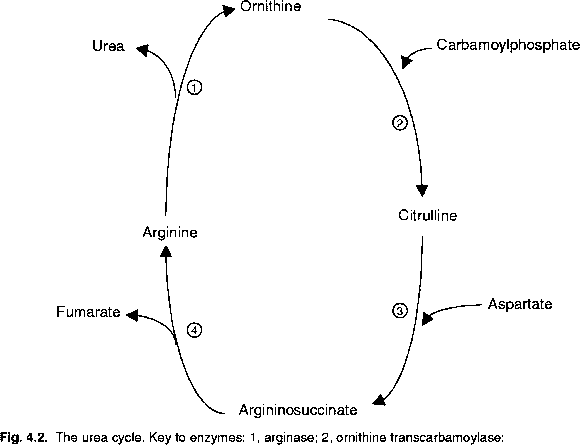 Groups of amino acids, such as aromatic amino acids, gave intermediate responses. Another approach has involved attempting to find, by isotopic labelling methods, which amino acid biosynthesis limits growth. Salter et ai (1979) found that different amino acids are formed de novo to differing extents when protein is available. Proline biosynthesis was affected particularly strongly when preformed proline was present. Similar in vitro experiments by Atasoglu et ai (1999) using 15NH3 confirmed the unusual sensitivity of proline biosynthesis to the provision of preformed amino acids, and identified glycine, valine and threonine as other amino acids whose biosynthesis was most sensitive to repression by added amino acids. Supplementation with these amino acids failed to replicate the stimulatory effects of a complete mixture of amino acids, however, indicating that the true nature of the amino acid limitation had not been identified. The third method involves a deletion approach, which has proved to be useful both in identifying and quantifying amino acid requirements in animals. In theory, deletion of only the first-limiting amino acid from a complete mixture should cause a decline in N retention, until the limitation imposed by the second-limiting amino acid is reached, and so on. The deletion approach applied to rumen fermentation (Atasoglu et ai, 2002) confirmed that no single amino acid limits ruminal fermentation, and identified phenylalanine, leucine and serine as key amino acids whose synthesis may be rate-limiting.